This publication is the fourth in a series initiated by FAO which began with the Mediterranean/Black Sea (1973, two volumes) and continued with the Eastern Indian Ocean/Western Central Pacific (1974, four volumes) and the Western Central Atlantic (1978, seven volumes). This series is aimed at establishing a worldwide annotated and illustrated inventory of aquatic species of interest to fisheries that should provide the fishery worker with a tool for the correct identification of the species occurring in his/her area, an international system of vernacular species names and elementary data on the fisheries for these species. The present set of Identification Sheets primarily covering the area of concern to the CECAF Committee, is the result of the joint efforts of more than 60 experts from the CECAF Region and elsewhere in the world, who have generously contributed their time and experience to a common goal. The execution of the project was closely coordinated with the preparation of the "Check-List of the Fishes of the Eastern Tropical Atlantic (CLOFETA)", sponsored by Unesco, so as to ensure consistency of nomenclature in these two complementary publications. The fact that every family or group of resources has been treated by an authority on the subject makes this publication a unique assemblage of firsthand information which could not have been brought together by any individual author. Furthermore, it is the only recent catalogue of species of interest to fisheries covering the Eastern Central Atlantic region in its entirety, comprising the Fishing Area 34 as well as the northern part of Fishing Area 47. Although the fishery resources of this region are, in general, reasonably well known, there are still considerable gaps in information on distribution, abundance and biology of many species, which are, to a large extent, the result of incorrect or insufficient identification of species in routine fishery work. With the growing need for proper management of fish stocks, more accurate detailed basic data are required on individual species. The user of the sheets can contribute significantly to the improvement of this reference work by communicating his/her practical experiences with the Sheets to FAO HO in Rome, to the CECAF Committee in Dakar, and/or to the respective authors. In this way, the systematist and the fishery worker will benefit from each other's work; and it is only through a continuing cooperation of this kind that these Identification Sheets will remain up-to-date and useful. 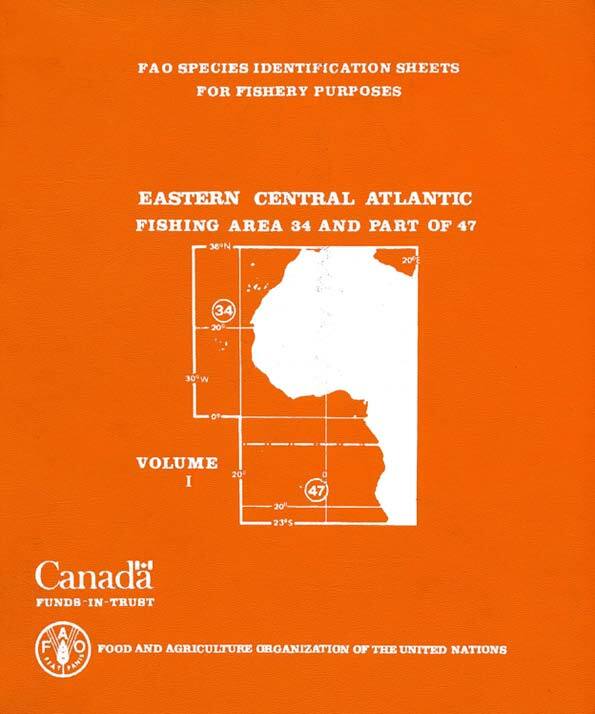 The production of this set of Species Identification Sheets would not have been possible without the generous financial support of the Canadian international Development Agency (CIDA) in the framework of the FAO/Canada Government Cooperative Programme, Project GCP/INT/180/CAN, and the valuable collaboration of the Department of Fisheries and Oceans, Canada, who have printed the document. Scientific editing was considerably facilitated through the cooperation of the Huntsman Marine Laboratory, St. Andrews, Canada.